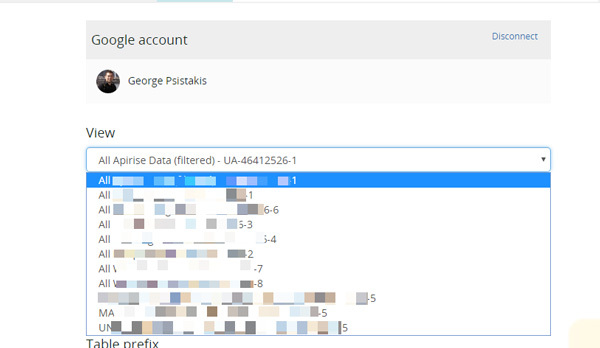 This integration will allow you to connect with Google Analytics and start collecting your data. It is a matter of minutes to send your data to feed your BI, your data warehouse, or your custom analytics stack. In order to connect Google Analytics with Blendo you should verify that you have at least Read & Analyze permissions (Google documentation) for your Google Analytics account. 1. To add this integration, go to Blendo dashboard. Click Add a Source and click on Google Analytics. 2. Click on Google Analytics icon. 3. Next you will be prompted to choose a Google account to log into and to approve Blendo’s access to your Google Analytics data. Blendo will only ever read your data. 5. In the new Setup your Google Analytics source screen, choose one of your Google Analytics views. Now we need to select the Dimensions and Metrics for the reports we want to replicate to your destination database. Valid Combinations: Not all Dimensions and Metrics can be queried together. Only those Dimension and Metrics combinations that follow Google’s compatibility rules can be saved. Have a look at the allowed combination at Google’s Dimensions & Metrics Explorer here. If a combination is not valid, Blendo will let you know. Google has a limit on the number of the Dimensions and Metrics you can define. Please check Google’s documentation here. Each report corresponds to one pipeline and one table. The Dimensions and Metrics combination can’t change after the pipeline integration is saved. The primary key Blendo creates depends on your choices during original setup. 6. In the Dimensions field, you can see the list of dimensions available for selection. You may use the autocomplete search or use the drop-down to explore it. 7. In the Metrics field, you can see the list of metrics available for selection. You may use the autocomplete search or use the drop-down to explore it. Blendo recognizes your custom metrics and dimensions and you can find them with their name. As a reminder you may find your custom dimensions and metrics into Google Analytics at Admin > Property Column > Custom Definitions > Custom Metric or Custom Dimension. When Blendo first connects to Google Analytics Data source, will schedule an initial sync job. That will include the historical data and may take some time to complete. Blendo syncs Google Analytics data based on the schedule and frequency you choose. The default setting is every 1 hour but is configurable from inside the app. The first time Blendo syncs your Google Analytics data performs a full replication. After that for every sync, we replicate the last 30 days’ worth of data to account for changes/updates made to existing records. After that for every sync, and regardless of your schedule setup, we replicate the last 15 days’ worth of data to account for changes/updates made to existing records within the default attribution window of 15 days. This ensures you will always have the most updated data. That means you may notice a higher number of replicated rows than what’s being generated in Google Analytics. For that reason setting your frequency in the default or daily syncs will help saving data and incur less overages. Note that Blendo will only read your data. If no errors, an integration status could be as Importing from source, Exporting to the destination, or Completed. What Google Analytics data do I have available? Blendo creates a table for each Google Analytics integration you create. The schema of the table will have the Dimensions, Metrics, and date as columns. the table will have sourceMedium, country, users, pageviews, start_date, end_date as columns. As Google Analytics do not provide a primary key that can be used for deduplication, the primary key is blendo_id. This is composed by using the dimension columns plus the date. Google Analytics data fetched on a daily basis. Every sync will pull the report for the current day. Standard Dimensions / Metrics These are the Standard Dimensions and Metrics by Google Analytics and they were selected in the initial pipeline integration setup. Custom Dimensions / Metrics These are the Custom Dimensions and Metrics you may have. Blendo recognizes your custom metrics and dimensions and you can find them with their name. They were also selected in the initial pipeline integration setup. Custom Goals These are the Custom Goals you may have. Blendo recognizes your custom goals and you can find them with their name.